Hillel and Sonya Chaiken lived in Chernigov from the time of their marriage until they immigrated to Philadelphia in 1913. We have borrowed this photograph from a wonderful site on Chernigov. Please click on the left to visit the site and read about the history of Chernigov. Chernigov was a Jewish community from the 13th century. It is 140 kilometers NNE of Kiev. In 1926 the Jewish population was over 10,000. During WWII, when the Nazis occupied the city in 1941, all of the Jews remaining in the city were killed. Capital city and oblast (province) in Ukraine. In 1623 the king of Poland, Ladislas IV, ordered the expulsion of the Jews from the districts of Chernigov and Seversk after complaints by the Christian merchants and craftsmen about Jewish competition. However, the decree was not implemented. The community of Chernigov is recorded among those destroyed during the Chmielnicki massacres of 1648. Chernigov passed to Russia in 1667, and the Jewish community was not renewed until the partition of Poland at the end of the 18th century. There were 1,389 Jew living in the city and district in 1801, and 2,783 in 1847. The census of 1897 recorded a Jewish population of 8,799 in the city (31.7% of the total) engaged in commerce and crafts (tailoring, shoemaking) and also in tobacco growing and business connected with the orchards in Chervigov and the vicinity. In October 1905 the Jews in Chernigov organized self - defense against pogroms there. 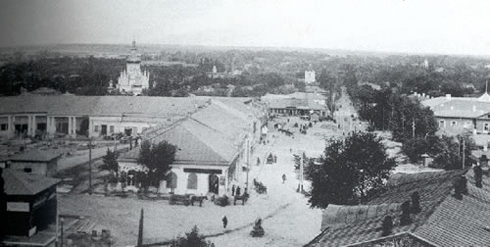 There were 13,954 Jews living in Chernigov in 1910. Under Soviet rule, communal and religious life came to an end. Many Jews left the city, and in 1926 there remained 10,607 Jews. The Jewish population was liquidated during the Nazi occupation in 1941. Jews returned to Chernigov after the war and were soon subject to the restrictions imposed on all Russian Jewish communities. The last synagogue was closed down by the authorities in 1959. All religious articles were confiscated and put in a museum. The Jewish cemetery was in a bad state of repair and in 1961 a local paper carried an article against separate Jewish burial rites. In 1970 the Jewish population of Chernigov was estimated at 4,000. If you are researching your roots from Chernigov and would like to join the Chernigov Sig mailing list, please click here.